The Chapel Guard is an Altmer bard who protects the Cheydinhal Chapel Undercroft. She appears at the start of The Elven Maiden quest and will attack you on sight for trespassing. If you are a Pilgrim in the Nine Divines faction (if the Knights of the Nine official plug-in is installed) she will leave you alone unless she sees Llathasa's Bust being stolen. She patrols the undercroft day and night, never eating or sleeping. If you manage to speak with her, she has two possible greetings. Under normal circumstances she will respond with "Have respect for the dead while you are down here." However, if her disposition towards you is lower than 40 she will say "I don't like the look of you. Pay your respects and get out." She will bid you farewell with the words: "Go with the grace of the Nine." After the quest, the Chapel Guard will stay in the Undercroft indefinitely. 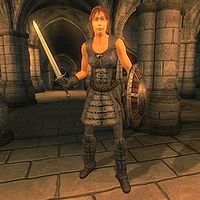 The guard always wears chainmail armor including boots, cuirass, gauntlets and greaves, and therefore can be a useful source of this equipment for low-level characters. She also has an iron shield and a steel shortsword. She carries the undercroft key, a torch and a small amount of gold. In combat she uses one high level Illusion spell. The beggars of the city aren't pleased with the posting of a guard in the chapel undercroft, and when asked about the Bust of Llathasa they will remark that the count "also posted a guard so that her tomb wouldn't be disturbed. Used to be anyone could visit her, but now it's off limits to the public." She is removed from the Corrupt Cheydinhal Guards faction at the end of the Corruption and Conscience quest. There is a second version of the Chapel Guard (editor ID TG03ChapelTombGuard, Form ID 0001E831) who only appears in the Construction Set. This page was last modified on 20 May 2018, at 06:28.